Google has opened the bag full of Christmas gifts early - it’s been celebrating 10 billion downloads on the Android Market by slashing prices on some of the finest app to a mere dime. No excuse not to get them, right? And many of you tried - after all a single buck for 10 apps is not something many would miss out on. However, some who tried to purchase apps from the 10-day 10-cent app promo, couldn’t get their orders through. Again, we apologize for any inconvenience and hope you have a wonderful holiday season. Once you get the message, you can proceed and finish your orders. 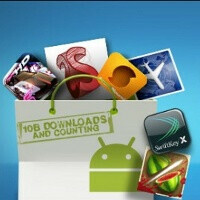 Here is the current set of 10 apps Google has radically discounted - enjoy! Yeah sure, too bad Google's CS is about as reliable as the National Enquirer. how's carrieriq and the other trojans and malwares on androids? problem mr droid? lol get your facts right moron, carrieriq is not used by google, and is infact confirmed on the iphone "Apple has confirmed the software is present within iOS 5, the company’s latest iOS operating system, but thankfully for those of us who use iPhones, it says that it will remove it in a future software update." http://www.cultofmac.com/134972/carrier-iq-we-only-unintentionally-collected-smartphone-users-text-messages/ ahah thus your argument is invalid. "only unintentionally" hahah... and i'm santa claus. :DD NOT! CarrierIQ is put on by manufacturers, not by google. However it was put on by APPLE directly. Nice try at trolling. You are kidding right?!? GJanee, do you do any research or do you just like to hear yourself say stupid things? It seems like the latter. Everyone knows Apple installed Carrier IQ, well everyone but you! lol Problem misinformed? Wierd... Never had malware or trojans on any of my phones. Are you making up stuff again for a winless fight? Oh you! I noticed that sometimes it would give me an eror when attempting to purchase - after a second try - no problems.